NOTE : most of the photographs below are hot-linked to either a larger version of the same photo or to a corresponding page in the pre-pro.com database. Just click on a photo to see more details, then use your browser's "Back" button to return to the article. If I had to give this edition of Random Shots a title, it would probably be along the lines of “All That Glisters is not Glass”. Purists will probably not appreciate me torturing Shakespeare's oft-quoted line from The Merchant of Venice in this way, but the city is synonymous with fine crystal glassware so it seems fitting for an article on the metal varieties of shot “glasses”. My first introduction to metal shots was not a happy one. I was a long-time shot collector but newly-introduced to the bounties of eBay. I had yet to learn that the ability to commit e-funds with the click of the wrist short-circuits the normal deliberative process during which one weighs the object’s history and worth. I happily forked over the costs of the auction and shipping on two metal pre-pro shots which, upon arrival several days later, turned out to be bottle caps! In retrospect, the presence of threads around the rims was a major clue as to their true origins [Figure 3], but they weren’t apparent as such in the auction photos. Not without good reason is "Caveat Emptor" the first rule of eBay! But there are a number of bona fide pre-pro metal shots and they provide an interesting means of breaking up the glittering regularity of a shot-glass display case. 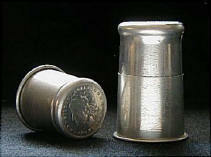 Metal shots come in three basic forms: telescoping [Figure 2], two-part sliders [Figure 1], and thimblefuls. The first of these is also the rarest and possibly oldest of the metal advertising shots. Telescoping shots consist of a wide base attached to the lower of 5 concentric chrome-plated bands that lock when pulled apart to form a 1-3/4” cup. Surprisingly, this simple form is both robust enough to drink from and completely liquor-tight. 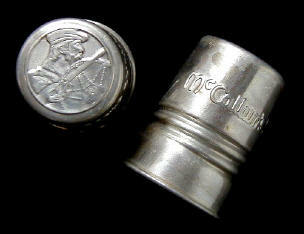 Brand information was stamped on a detachable lid that clips over the base of the collapsed shot and allows it to be tucked neatly into a vest pocket. Although unbranded versions bearing only patent information or the word "Knox" appear for sale occasionally, the only version I've seen bearing liquor advertising is shown in Figure 4. 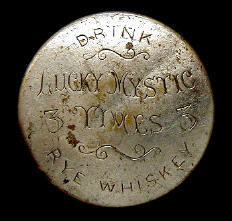 The cap reads DRINK / LUCKY MYSTIC / 3 TIMES 3 / RYE WHISKEY. This shot’s origins remained unknown until a booklet advertising Lucky Mystic whiskey appeared at auction about a year ago. It showcased the wares of Mihalovitch, Fletcher & Co., a Cincinnati-based company that first appeared in city directories in 1875. The only other telescoping “shots” I know of all stand around 3” tall when open and are made of aluminum. One advertises Victor Whiskey [Figure 5], the product of an old and revered Philadelphia concern. 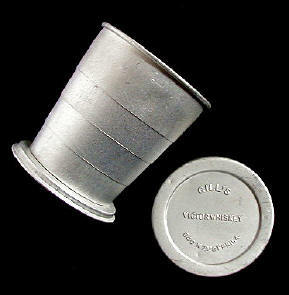 The company was established in 1832 by J. A. Daugherty and operated from ca. 1844 until Prohibition by two generations of Gills. The cup has a decidedly industrial or even WWII-era military feel to it and must have been the pre-pro equivalent of the modern Big Gulp promoted by 7-11 convenience stores. 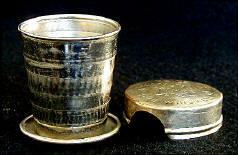 Another example of this type of aluminum cup is listed in Edmonson’s Old Advertising Spirits Glasses. It was distributed by Peter Espenscheid of Mt Vernon IN, and it's likely that there are several additional examples that are unlisted.